My computer crashed... this is one of the photos that was salvaged. 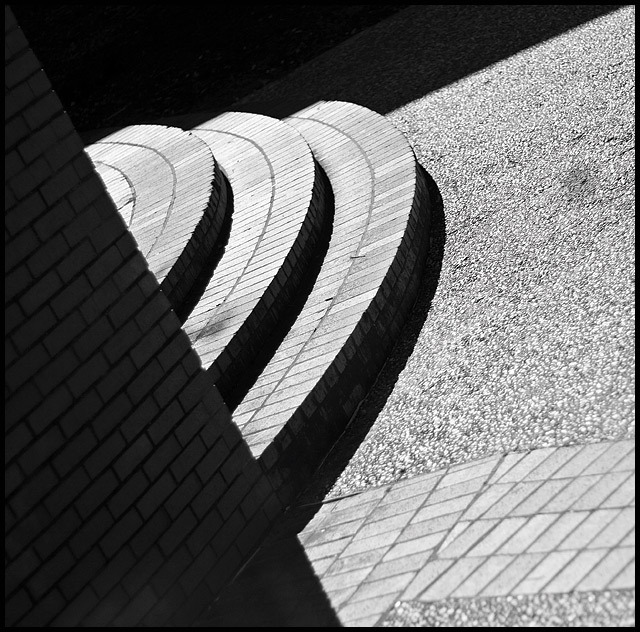 I noticed these shadows and steps one day walking on campus. Metaphysical realists believe in the existence of universals, which account for attribute agreement and true subject predicate agreement (supposedly). And that is what inspired the title. lets see, curves and soft light for contrast, converted to b&w via caculations, cropped, resize, usm, border, sfw. Nice study of shape however I think the wall on the bottom left takes up a little too much of the frame. It may work if the diagonal of the edge was more on the diagonal. A good effort at getting an interesting shot out of an ordinary scene. I think a bit more contrast might give it more punch, but it's still good. I have passed by this image about 5 times and unfortenuately I continue to not be that excited about it. Sorry. The conversion to B&W is dull and I would have tried to bump up the contrast. Maybe even rotate the image so that the wall on the left is actually horizontal and giving the perspective that the steps are coming out of the ground. Regardless, will score tough in this challenge. Good Luck. 4. Proudly hosted by Sargasso Networks. Current Server Time: 04/23/2019 12:16:55 PM EDT.